It’s tempting simply to note that director Tom Dey bookends Marmaduke with fart jokes, and leave it at that. Dey’s cinematic adaptation of Brad Anderson’s widely tolerated comic strip about a giant, awkward dog is meant for kids. Kids love dogs and fart jokes. The goods are being delivered to the target audience. All others should look away. But leaving it there would mean ignoring the full, awkward flavor of the movie, which opens with the eponymous dog speaking in the voice of Owen Wilson about the difficulties of being a teenager. Whether he means he’s a teenager in dog years or human years is addressed only by the sheer statistical improbability of a Great Dane—a famously short-lived breed—making it to double digits, at least without crippling infirmities. 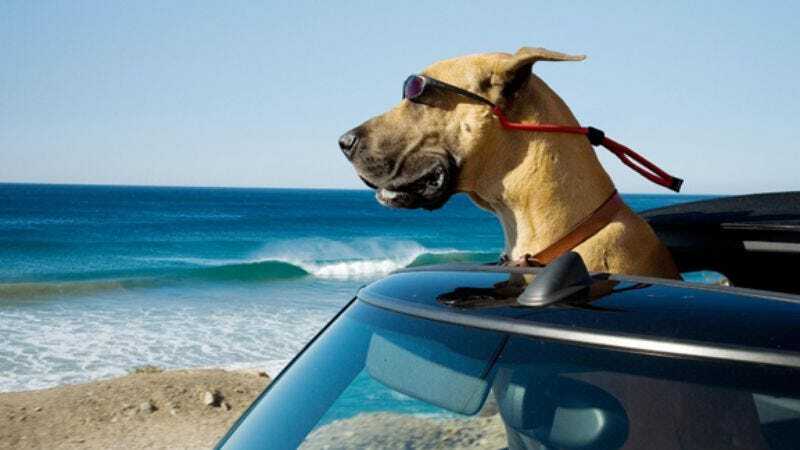 A film about a wheezing, hobbling Marmaduke would be a lot less fun than one that finds him in the prime of life. Or would it? That’s another question that lingers as the film follows Marmaduke and his owners (Lee Pace and Judy Greer) to California, where Pace takes a job marketing an organic dog-food brand produced by eccentric dog-lover William H. Macy. There, Marmaduke hangs out in a dog park populated entirely by other teen-esque dogs, all of whom stick to cliquey packs in line with high-school-movie clichés, from the pedigreed snobs on down. But these dogs don’t just hang out together during the day. Thanks to the apparent mass negligence of every dog owner in their California town, they also party all night, playing Dance Dance Revolution or attending beach parties lorded over by a mean, Kiefer Sutherland-voiced alpha dog. How can Marmaduke break his deadlock on the canine social order? Can you say “A surf contest for dogs”? Well, even if you can’t, William H. Macy can, and it’s strange hearing his familiar Mametian cadence applied to the line. Strange, too, that writers Vince Di Meglio and Tim Rasmussen (License To Wed) would pack the script with references to The O.C., “Who Let The Dogs Out?”, and other pop-culture items that were popular before their target audience was born. Those sorts of allusions, whether or not they make sense, are just a post-Shrek obligation now. So is the filling out of the voice cast with familiar names, most of who sound appropriately bored. Marmaduke saves its farts for the beginning and end, but the stink carries through the whole movie.